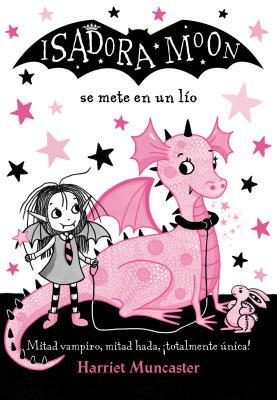 Isadora Moon se mete en un lío / Isadora Moon Gets in Trouble (Paperback) | River Dog Book Co.
¿Por qué no llevar un dragón? ¿Qué podría salir mal? Half vampire, half fairy, totally unique! Isadora Moon is special because she is different. Her mum is a fairy and her dad is a vampire and she is a bit of both. When Isadora's cousin, Mirabelle, comes to stay, Isadora is really excited. Mirabelle, who is a witch, is older than Isadora and always has the best ideas for things to do. So when she suggests that instead of taking Pink Rabbit Isadora should take a dragon to 'Bring Your Pet to School Day', Isadora ignores her worries and goes along with the plan. But looking after a dragon turns out to be a little bit harder than the pair of them expect . . .
With irresistible pink and black artwork throughout by author/illustrator Harriet Muncaster and a totally unique heroine with an out-of-this-world family, this is a beautiful, charming, and funny series of first chapter books. Perfect for fans of Claude, Dixie O'Day, and Squishy McFluff, Isadora Moon is the ideal choice for readers who want their magic and sparkle with a bit of bite!"